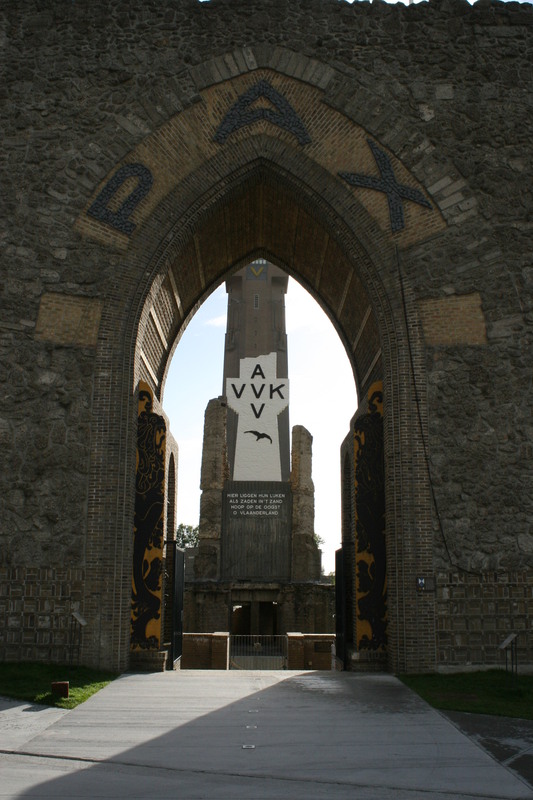 Our tour ends in Diksmuide, where the new Yser Tower looks down on the remains of the old Yser Tower. All will be revealed. But first. 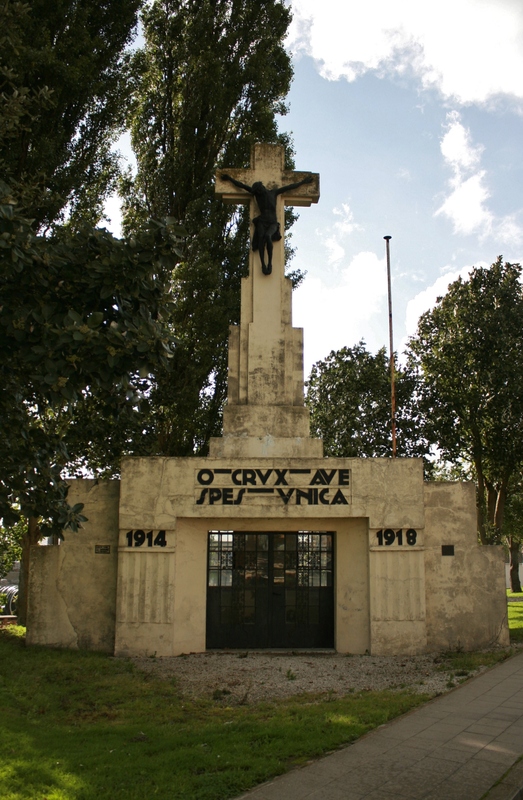 As we reach the outskirts of Diksmuide, on the banks of the canal, we pass this somewhat dilapidated calvary war memorial. 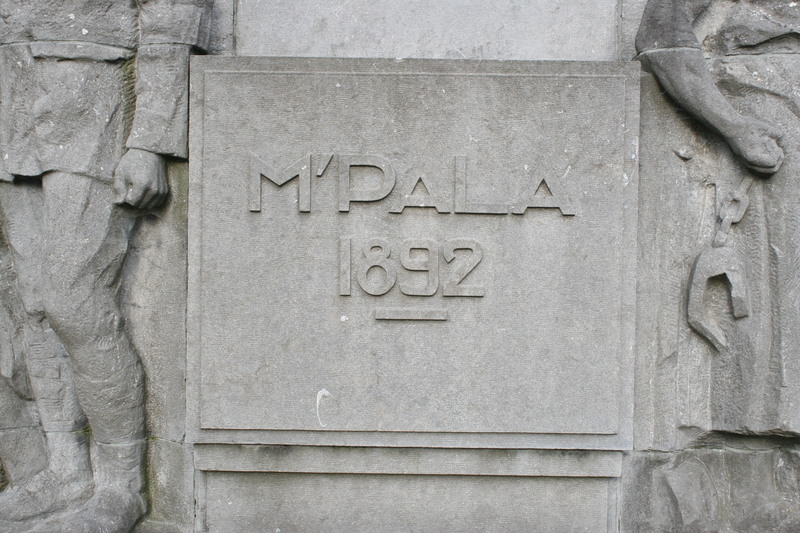 Inaugurated in 1928 by King Leopold III, it remembers the dead of all nationalities who fought on the Yser. Or is it just those on the winning side? What I have managed to find out, and there’s precious little, is somewhat ambiguous on this point, so if anyone out there can enlighten me…? Update: And they can. Enlighten me, I mean. See Chris from Belgium’s comments at the end of the post. Inside, a little chapel has seen better times. A curious, tatty little place, don’t you think? 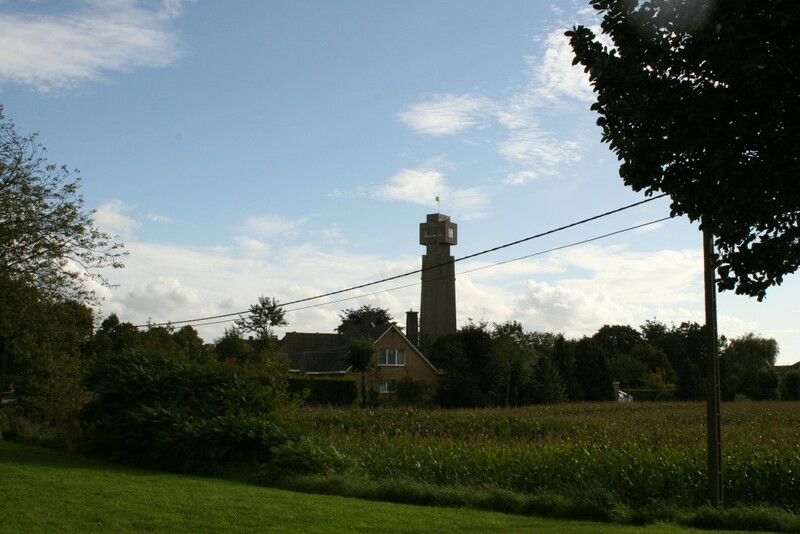 Across the fields, the slightly menacing Yser Tower. 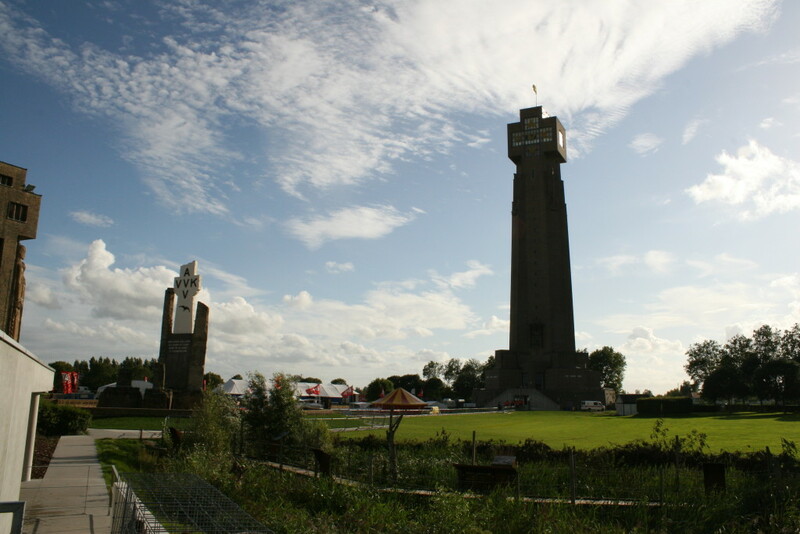 It’s a strange place, the Yser Tower, with a strange atmosphere. 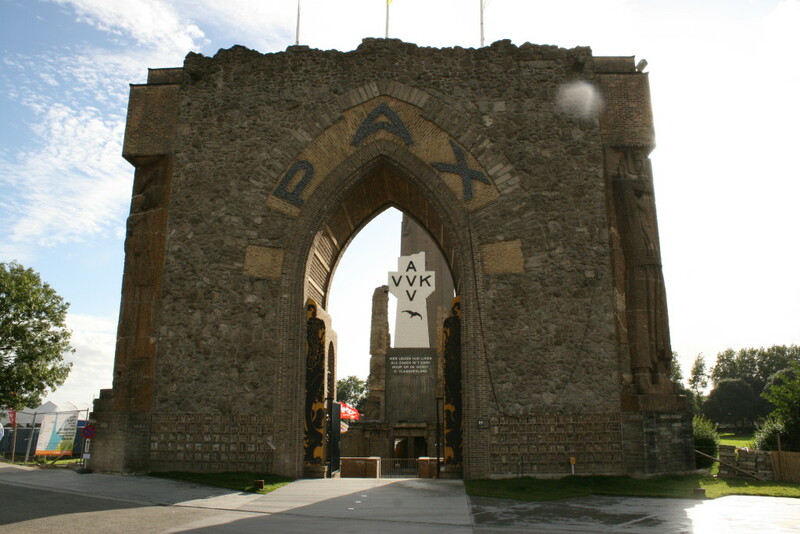 The Pax Gate was built in the 1950s from the remains of the first tower. I’ll explain in a minute. As it turns out there’s a gig here tonight so we can’t get in to look around. Peace. In the background the modern tower, built in the 1950s, rises high into the sky. In the foreground, the remains of part of the original tower, blown up on the night of 15th March 1946 for political reasons which I actually don’t intend to go into here. Well, not much. The inscription beneath the white cross says ‘Here lie their bodies like seeds in the sand, hoping for the harvest, O Flanders’. 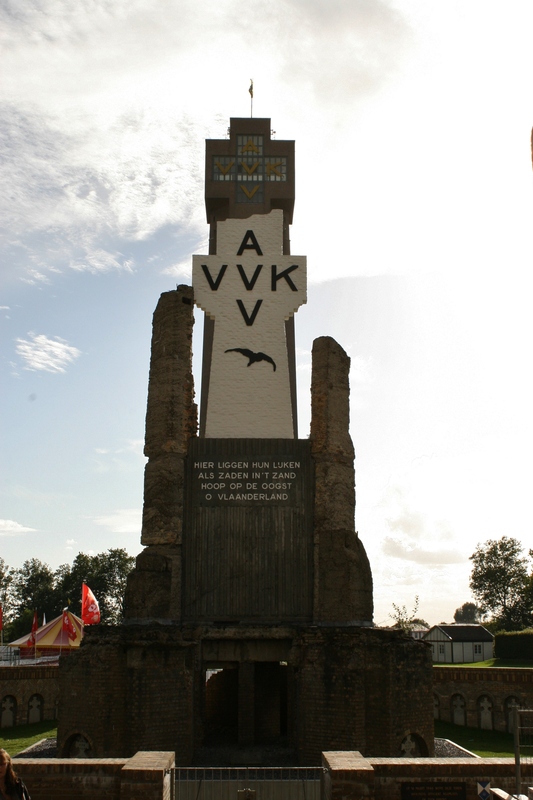 At the foot of the old tower a lamp burns at the AVV-VVK* headstone ‘to all who were killed for Flanders’. 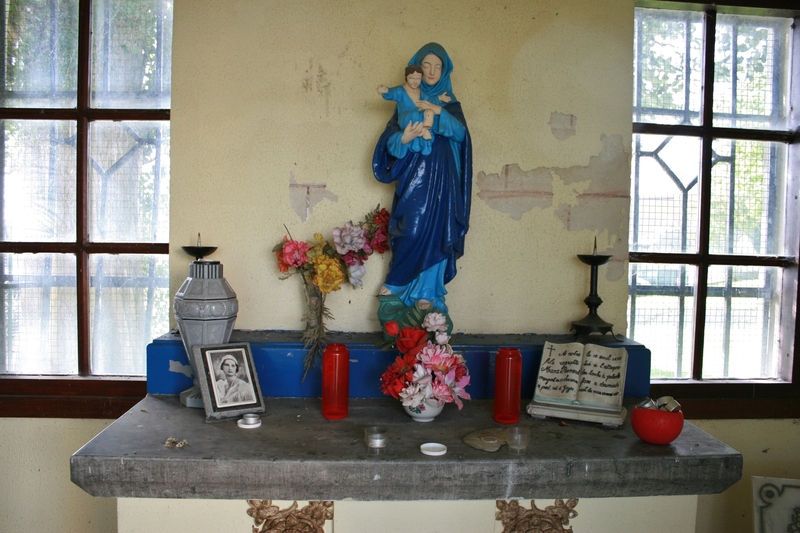 *Alles Voor Vlaanderen – Vlaanderen Voor Kristus. All For Flanders – Flanders for Christ. 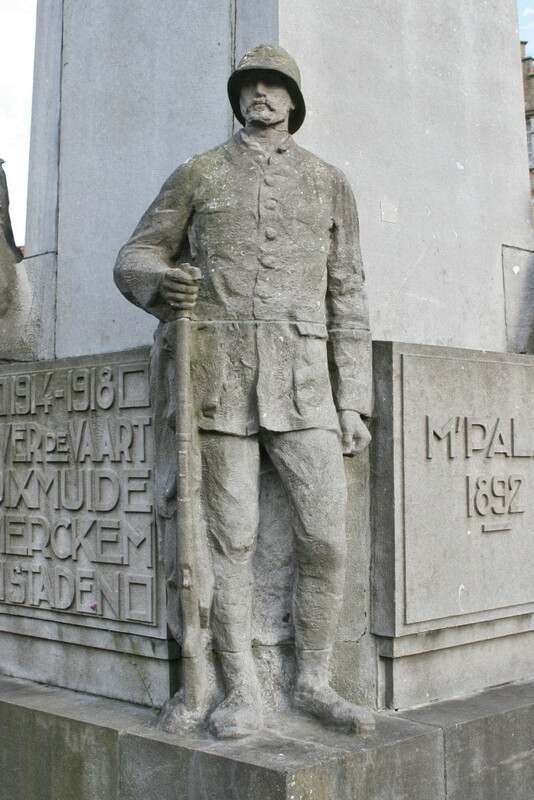 Because, historically, the Belgian Army officer class was made up almost entirely of (I suppose there must have been the odd exception to the rule) French speakers, and because the majority of ordinary ranks were Flemish speaking, resentment had grown over many years. 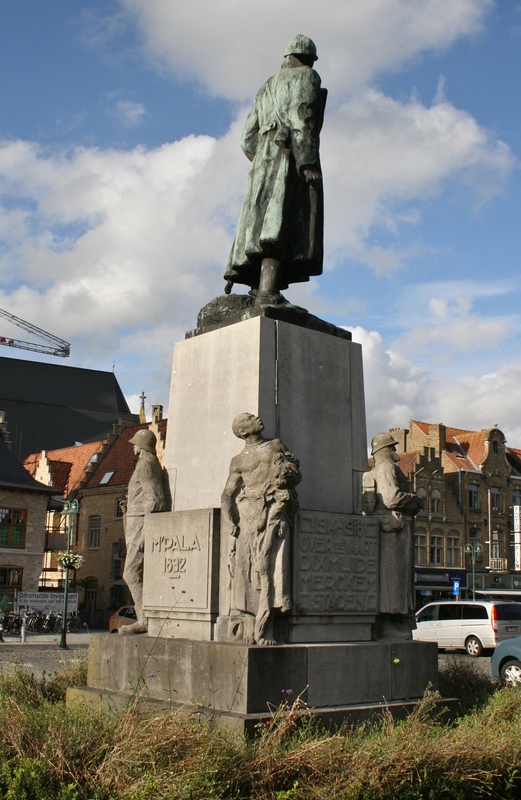 Thousands of Flemish-speaking Belgians died for their country during the war, and after hostilities ceased, the rise of the Flemish nationalist movement continued apace. In 1930 the first Yser Tower was inaugurated to remember all Flemish war dead, and Flemish victims of war were buried in the crypt (the ‘seeds in the sand’). 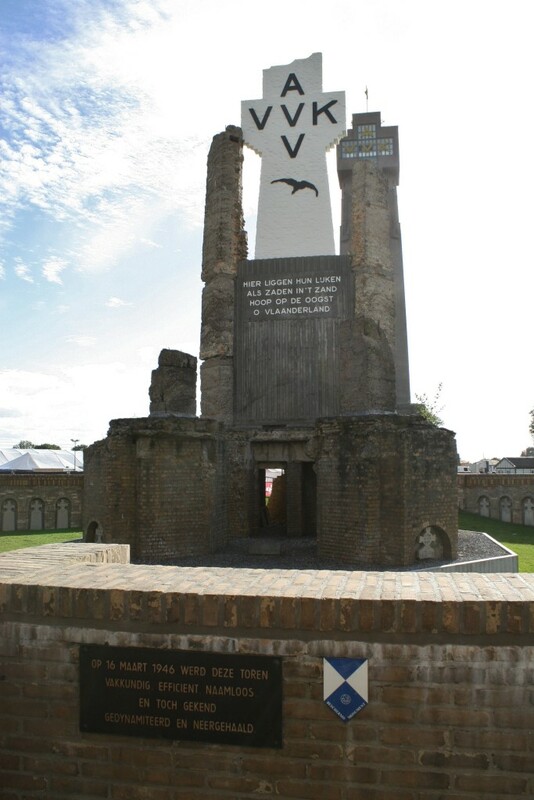 For reasons that you will have to find out elsewhere (it ain’t difficult), the tower was blown up in 1946. The perpetrators were never found. The current tower was inaugurated in 1965, and in the 1990s the crypt, for that is what you are looking at in the photos above & below, was restored, with the original Flemish headstones lining the inside wall. 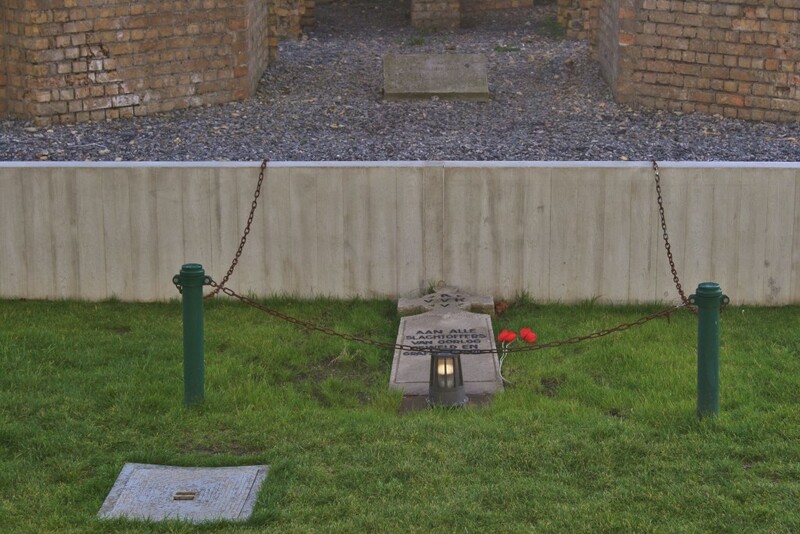 For the first two years of the war Flemish soldiers who were killed were buried beneath headstones which bore the inscription ‘Mort Pour la Belgique’. 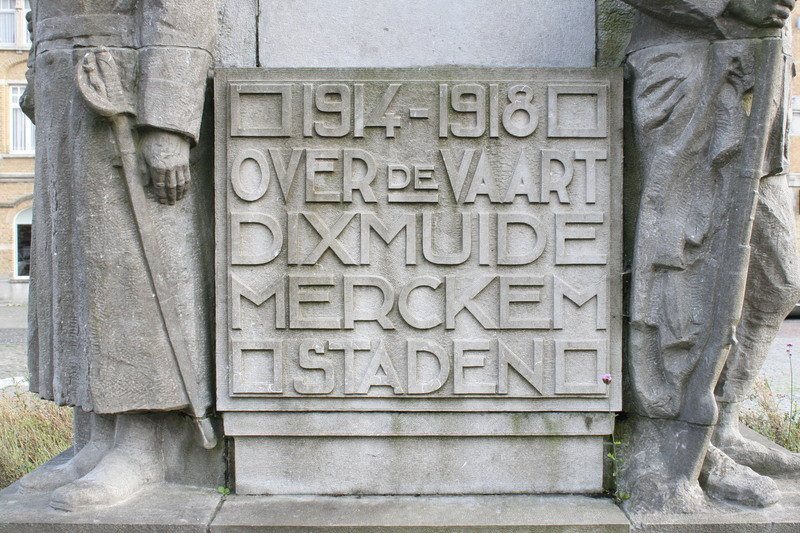 In 1916 a Flemish headstone, the ‘Heldenhuldezerkjes’, a cross with the AVV-VVK inscription, was introduced, and these are the headstones you see in the above photographs. 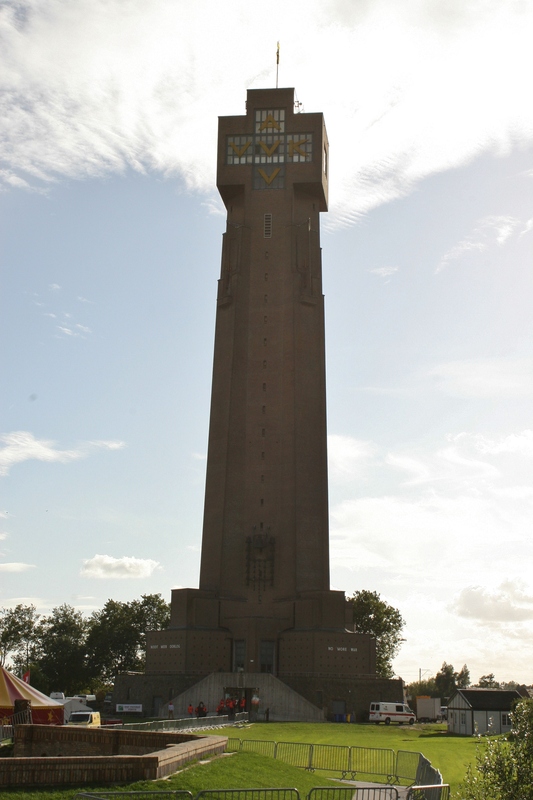 ‘On the 16th March 1946, this tower was professionally, efficiently, anonymously, but yet by persons known, blown up and pulled down’. 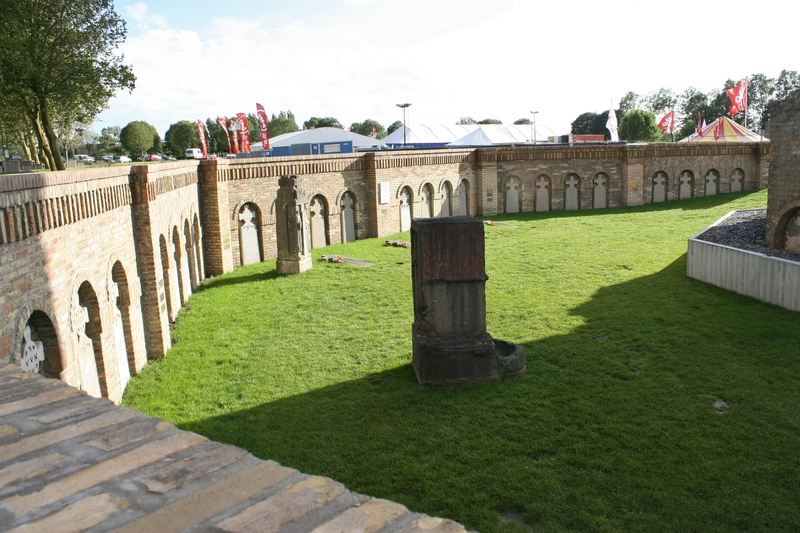 There’s a museum inside the tower, and a fine view from the top, but those chaps in red weren’t about to let the likes of Baldrick and me up their tower on this particular day. 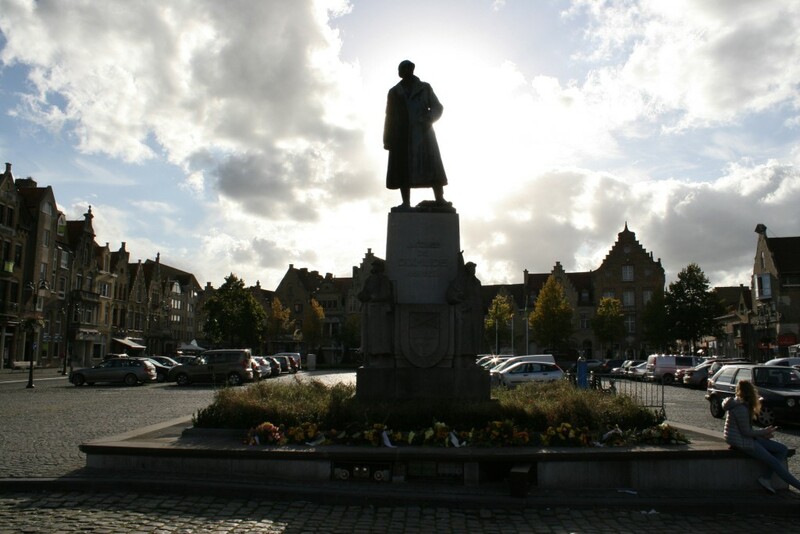 From the Yser Tower to the centre of town, where this fine statue of Baron Lieutenant General Alphonse Jacques de Dixmude, the hero of Diksmuide during the Battle of the Yser, is the final stop on our tour. He was the man in charge of the Franco-Belgian troops who resisted the Germans in Diksmuide throughout the battle. How ironic, then, that ten days after the official end to the battle, the ruined town would fall to the Germans as the French troops holding it withdrew west across the canal. 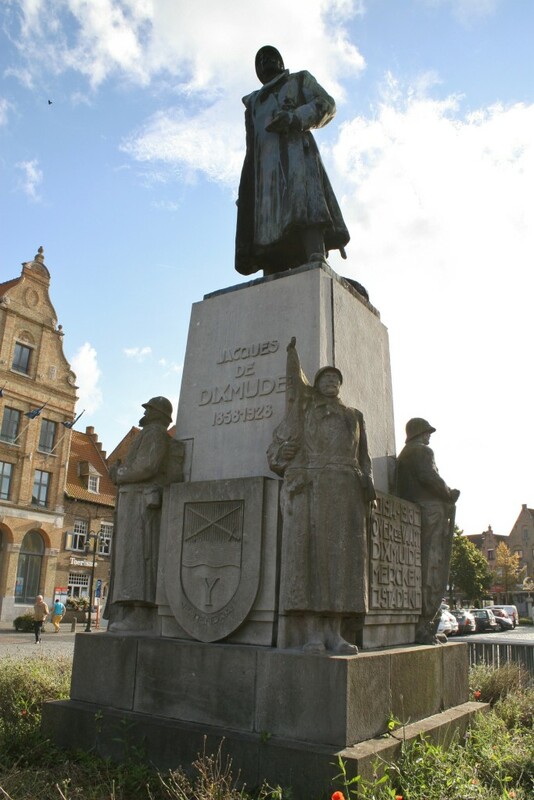 Nonetheless, it was Jacques’ men who prevented the Germans from breaking through on this front when it really mattered, and for that he was awarded the title of Baron de Dixmude after the war. 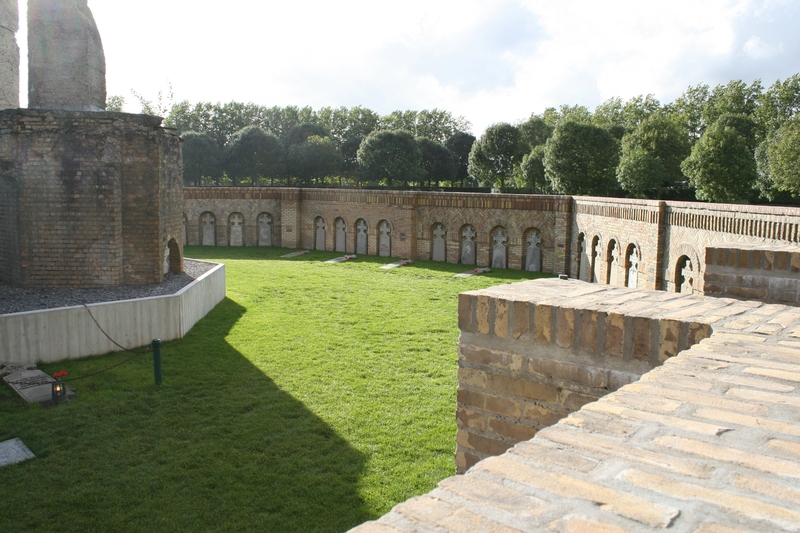 The first attack on Diksmuide took place towards sunset on the evening of 16th October 1914, sheer weight of numbers capturing the French front line trenches. Fighting continued all night until a dawn counter-attack succeeded in recapturing them. Heavy fighting broke out here again on the 20th, and at daybreak the following day wave upon wave of Germans hurled themselves on the Franco-Belgian positions. Eight separate attacks left hundreds of German dead piled up in front of the defenders’ trenches, but there was no breakthrough. At sunset, a final German assault was also repulsed. 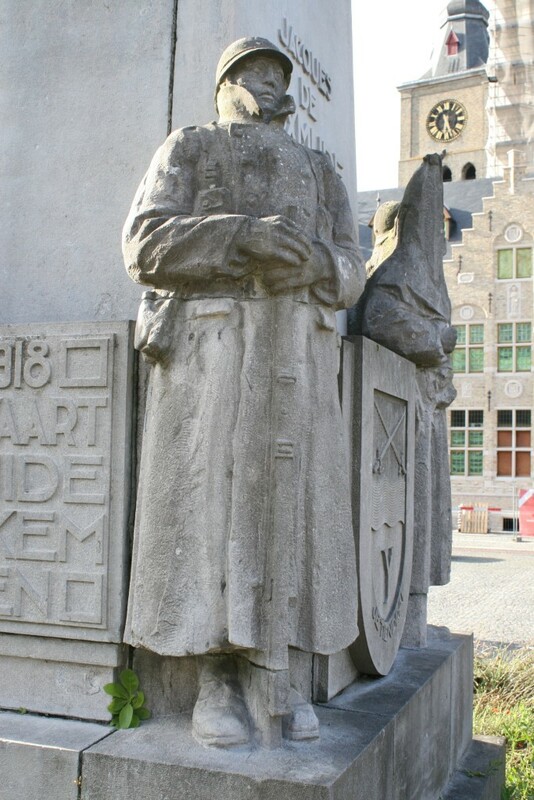 On the night of the 23rd October, following two days of furious fighting further north, the Germans again attacked Diksmuide. 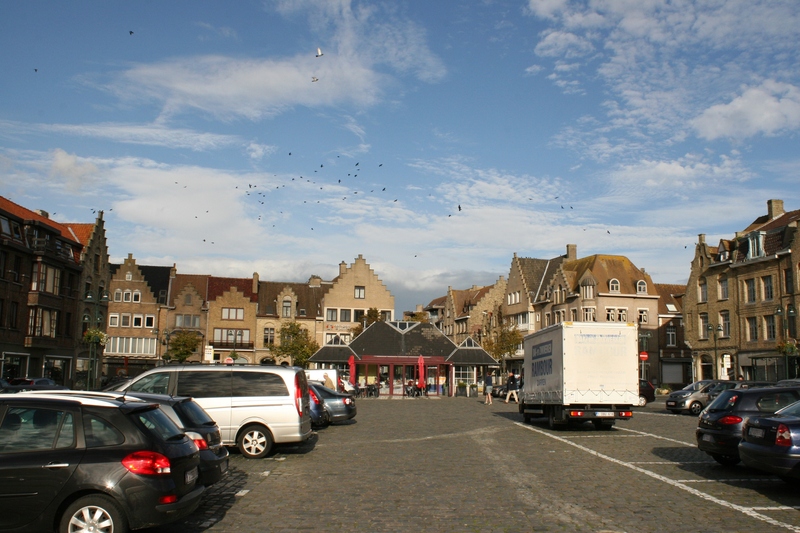 No less than fourteen (some reports say fifteen) separate attacks were made on the town, but again the defenders held firm. Battle was renewed along the whole Nieuwpoort-Diksmuide sector the following day, and on the 26th, after a day long bombardment, German infantry once again attacked at Diksmuide, and once again their attack failed. The evening of 28th October saw further attacks on Diksmuide, and further repulses for the Germans. 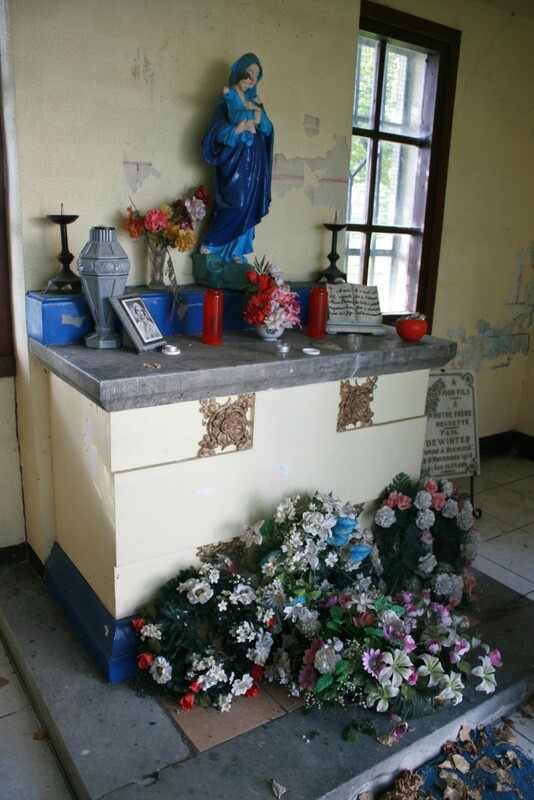 By now, as you can well imagine, the town, like the men, was completely shattered. On 29th October Diksmuide was once again the target of heavy bombardment from German artillery, and as we have already seen earlier on this tour, the last two days of the month saw furious German attacks further north at Ramscappelle and Pervijze as the flood waters rose and time, for the invaders, ran out. 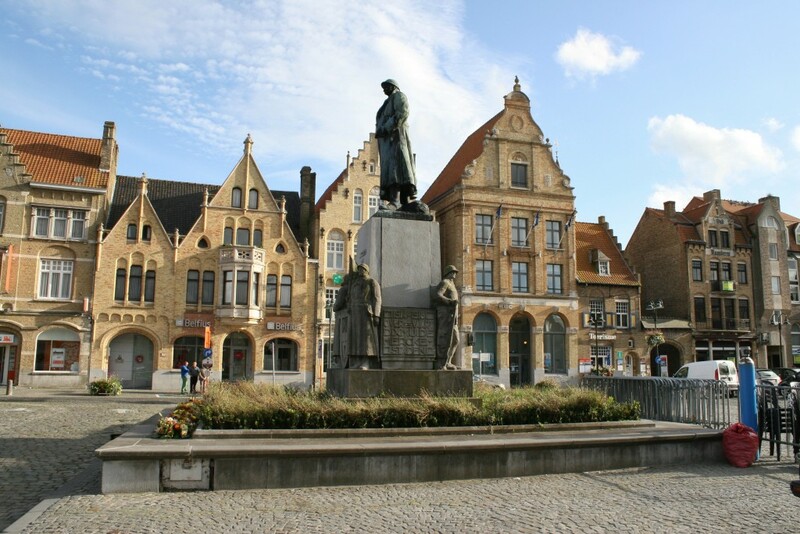 …attention being already focused on the City of Ypres further south, where British and French troops were already three weeks into the desperate battles to prevent the city from falling to the Germans that would later become known as the First Battle of Ypres. 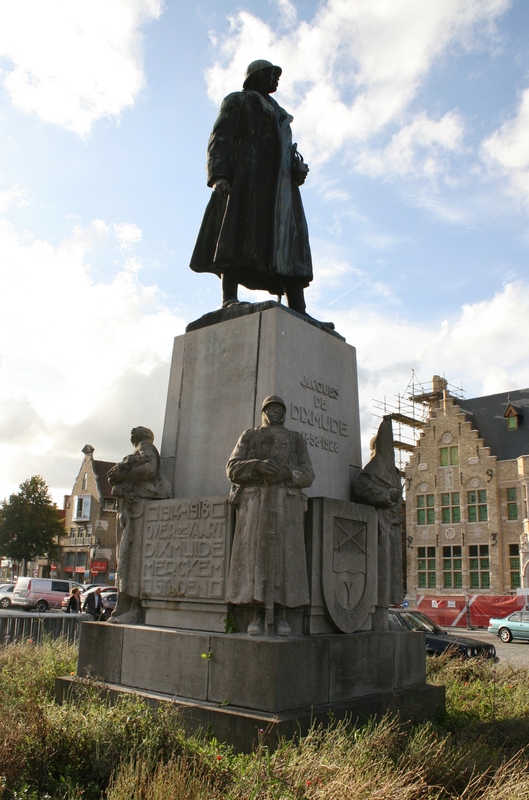 In 1915 it was Jacques who took the decision to extend the Dodengang as a way of assaulting the oil tanks along the banks of the Yser (see previous post). 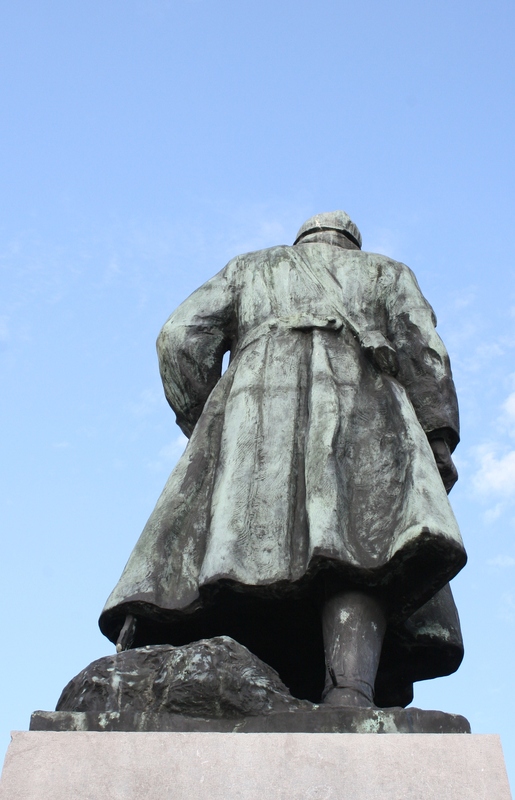 From what I can find out, and not unusually in the late nineteenth century, Jacques spent much of his early military career in Africa. Jacques’ involvement in the days prior to the creation of the Belgian Congo in 1908, and the questionable tactics involved, led to his name appearing in the Casement Report of 1903. 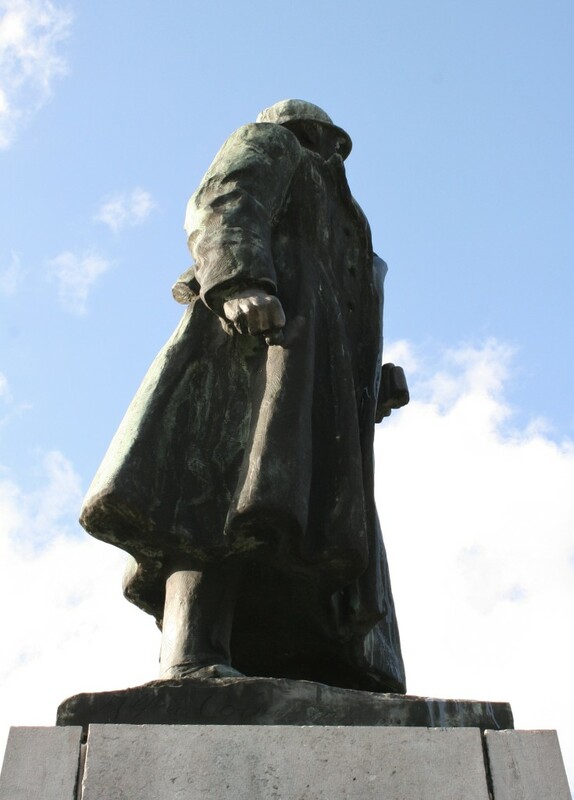 The same Roger Casement, at the time British Consul in the Congo Free State, and later Knight of the Realm, who would be executed by the British for treason in 1916. 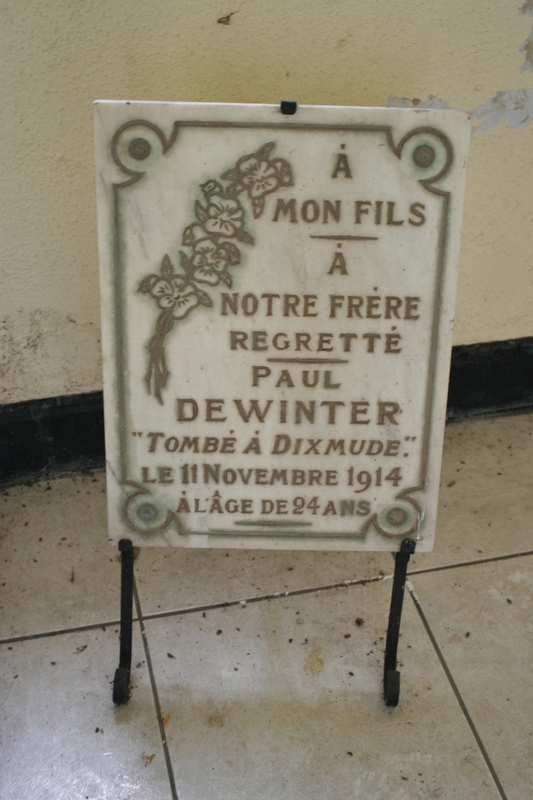 During the course of the war, more than 40,000 Belgian servicemen lost their lives. 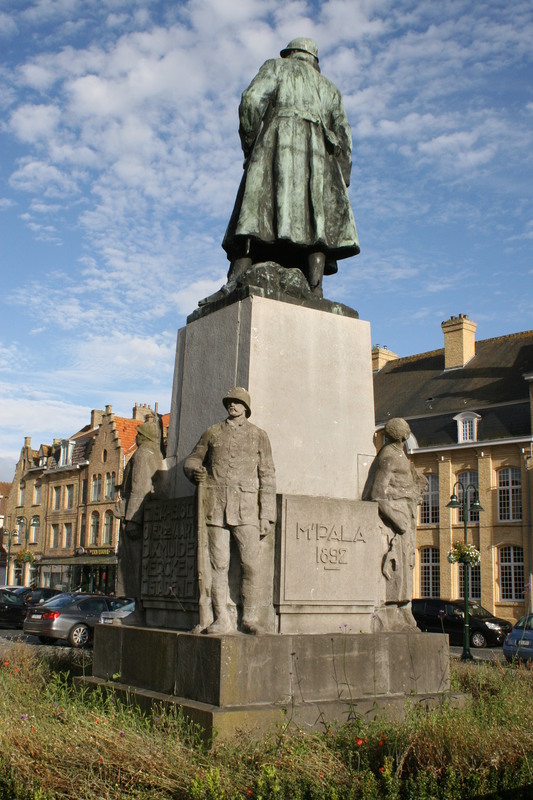 Casualties during the two weeks of the Battle of the Yser were about 20,000, of whom 3000 died. That leaves an awful lot of men to die over the next four years in a sector where no breakthrough was ever achieved by either side. 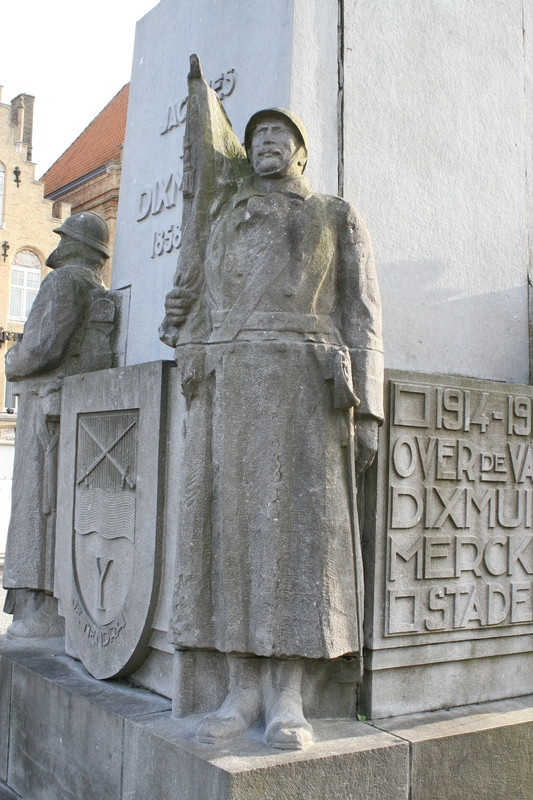 The French suffered 5000 casualties during the battle and subsequent loss of Diksmuide. 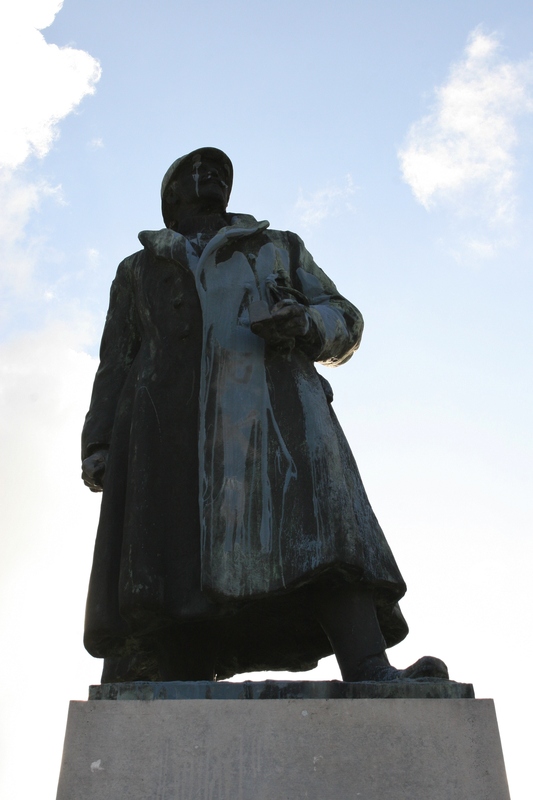 German casualties for the battle are more difficult to ascertain. Whilst browsing I came across a copy of the Bay of Plenty Times (really!) from 25th November 1914 which announced that the Germans themselves had estimated their casualties during the battle as 200,000! Other reports say, 76,000, 28,000, and so on. If anyone really knows, do get in touch. Before we finish, a quick reminder that there is a Tour Map elsewhere on this site that will show you where all the stops we have made on this tour are located. In case you’d forgotten. And in case you are interested. Our tour of the Belgian Sector ends here, in this now peaceful square in the centre of rebuilt Diksmuide. 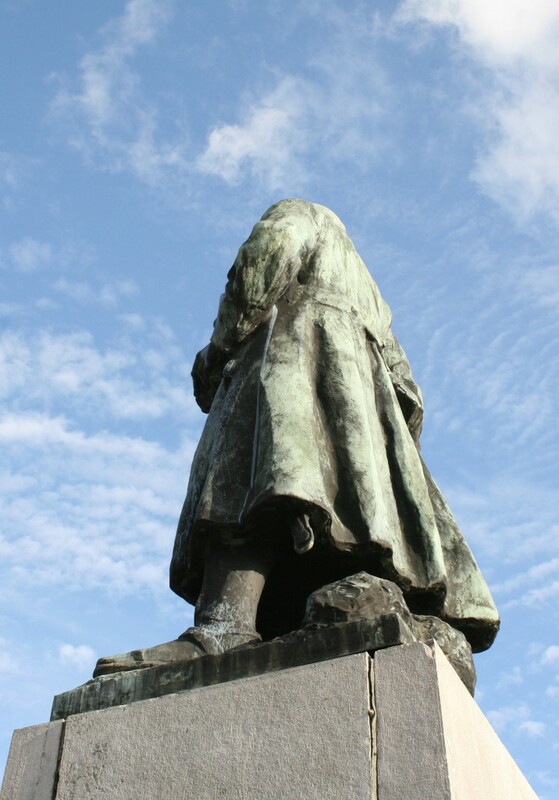 There are other things to see, of course there are, in this sector (three Demarcation Stones in Nieuwpoort for starters), but I think we’ve shown you most of the major points of interest along the way, and who knows, maybe Baldrick* & I will return one day and fill in the gaps. *thanks for everything on this tour, good Sir. Including the use of your photos in some posts. Couldn’t have done it without ya! 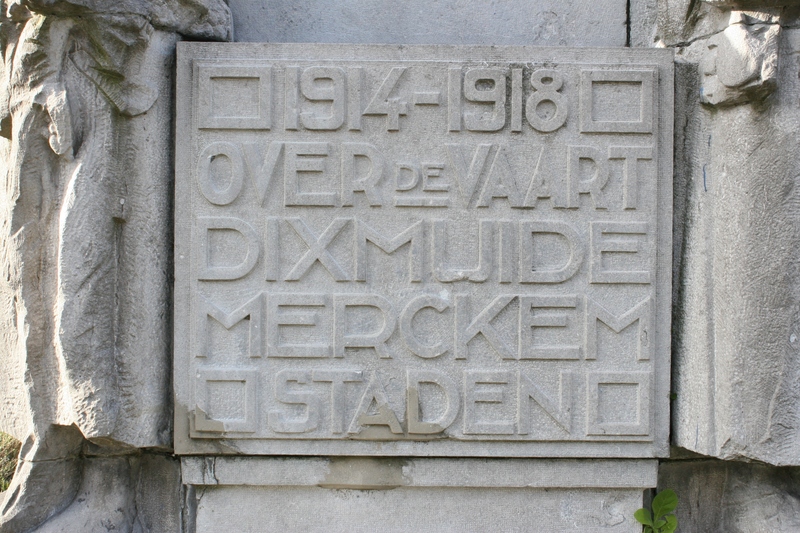 This entry was posted in Diksmuide, The Belgian Sector. Bookmark the permalink. Aw man, indeed! It was a long day, this one, wasn’t it? Don’t forget that we also visited a couple of other places on this day, stuff that doesn’t fit in with this tour but will appear here sooner or later, so we didn’t do a bad job, my good friend. And hunger? Tell me about it! 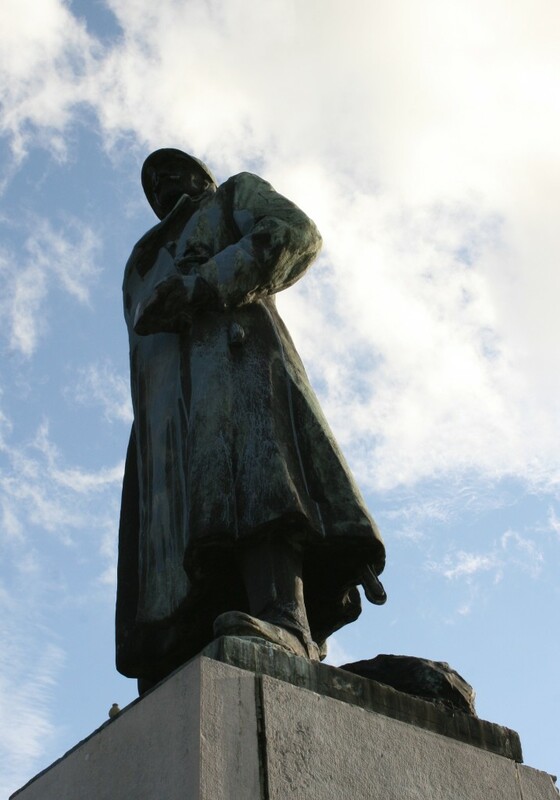 Thanks for taking me with you on a part of the Western front I have never been to. Hey Joe! As you know, you’re always welcome on our trips! Glad you found this one of interest. 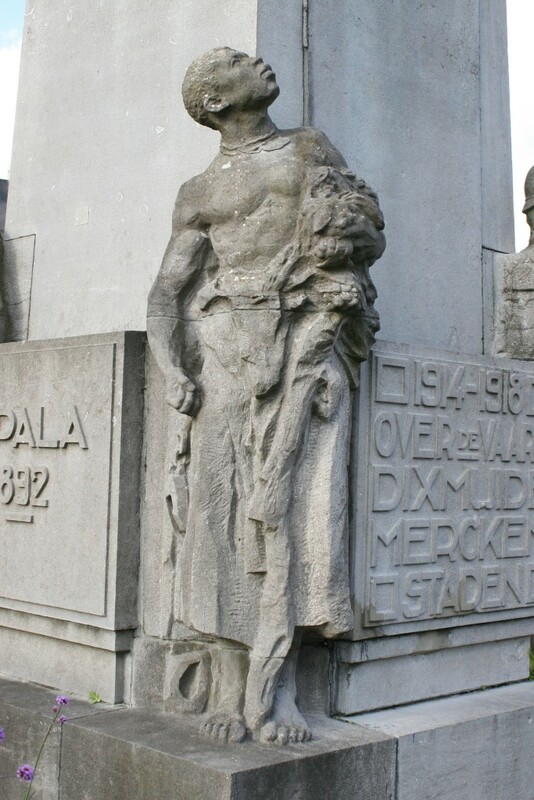 The “calvary war memorial” (second picture on this page), called “Calvarieberg” (Calvary mountain) was a religious monument for all who lost their life during WWI, be it friend or foe. Again, many thanks. There’s nothing better than asking a question and getting an answer. I shall update the post accordingly in due course.